Call for papers e-mails are sent out throughout the year to hundreds of universities and colleges across the nation and internationally. Professors and bioethics departments that are on our e-mail lists receive the call for papers that they pass on to students within their departments and classes. If you would like to be added to our e-mail list or questions about PBJ, please reach us at pbjeditorinchief@gmail.com. 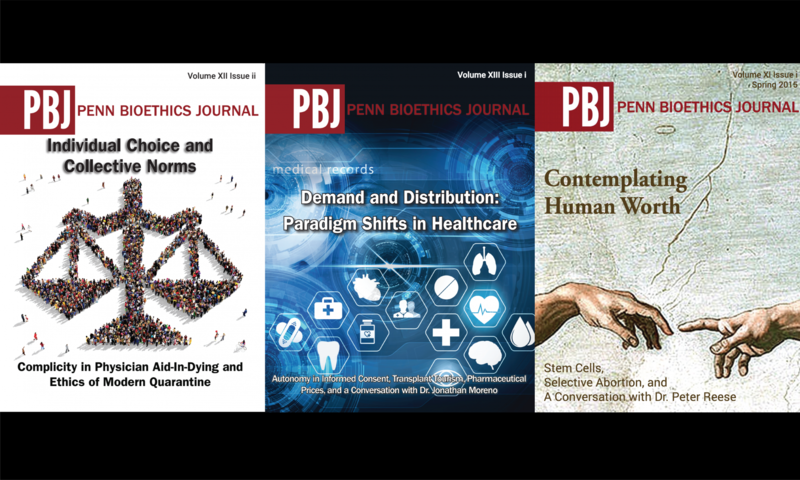 All undergraduate students may submit bioethics pieces to the PBJ by the submission deadline (please see more information under the “submit” tab). These pieces undergo a rigorous three-part evaluation. There is first a preliminary screening process by the executive board of the Editor-in-Chief and Managing Editors of PBJ. Second, papers passing the initial screen are reviewed by several Associate Editors in small group meetings led by a Managing Editor. After several discussions, the submissions are ranked and further narrowed down to a final selection of papers. Finally, these papers are discussed amongst the entire body at the semester General Body Meeting. At this meeting, all remaining submissions are voted on to determine the papers that will ultimately be selected for publication in that semester’s issue. The selected papers then undergo an editing process for the remainder of the semester. A group of Associate Editors led by two Managing Editors give feedback on the papers and work through multiple revisions with the author. The revisions and feedback range from content and focus to copy-editing. The publication is then prepared for publication and undergoes final copy-editing for any remaining grammatical and smaller errors.